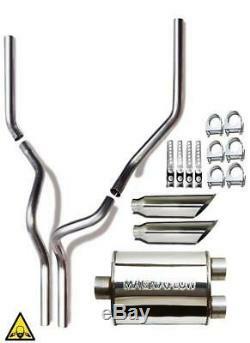 Dual performance exhaust with muffler for Chevy and GMC Trucks. 1999 (New Body Style) To 2008 Chevrolet / GMC Trucks , C , K10, K20 , K1500 , K2500 V6 And V8 Models 4.3L / 5.3L Wheel base 119" 133" And 143.5 Dual Conversion Kit. (2) LH / RH Exhaust Pipes 2.5 (2 1/2) O. (2) LH / RH Tail Tips 3.5" Outlet 2.5" Inlet 18" Length (304 Stainless Steel , Polished Mirror Finish) (6) Exhaust Clamps 2.5" (2 1/2) (4) Exhaust Hangers (1) Magnaflow. Stainless Steel Muffler (Center / Dual). This Kit Will Convert Your Old Single Outlet Exhaust System Into Two 3.5 Outlet system. Great look And Better Performance. Our muffler uses fiberglass matting technology to absorb unwanted interior resonance while maintaining a mellow performance tone. NOT LIKE MOST KITS ONLINE. Stainless Steel exhaust tips For a longer life Time and better performance. Please Be Advise Some Modification may be need it and some Mechanical Knowledge Is Required To Install This Kit. 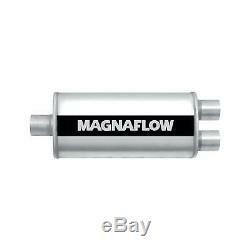 Only The Muffler is Magnaflow brand. This is not a direct fit kit some cases some modification is need it. &###x200B;&###x200B;&###x200B;&###x200B;&###x200B;&###x200B;&##x200B. &###xA0; We are committed to providing our customers with low prices and world class service. Orders received after 12:30pm Est. &###x200B;&###x200B;&###x200B;&###x200B;&###x200B;&###x200B;&###x200B;Feedback: We want you to be 100% satisfied with your order. If you are not satisfied with your order for any reason, please let us know BEFORE leaving feedback! Thank you for your business and we are happy to serve you as our valued customer! If you have any questions or concerns, please send us a message BEFORE leaving feedback. Listing Errors: We do our best to correct errors when discovered, and we reserve the right to revoke any stated offer and to correct any errors, inaccuracies or omissions (including after an order has been submitted) and to change or update information at any time without prior notice. Please note that such errors, inaccuracies or omissions may relate to pricing, quantity and availability, and we reserve the right to cancel or refuse any order placed based on incorrect pricing, quantity or availability information. If an item arrives damaged, it must be reported to us immediately, so that we can correct the situation. New items that have been installed or altered are non-returnable. Before installing the parts, please match it with the existing part you want to replace and make sure it is the correct part(s). &###xA0;&###xA0;Do not try to force an installation if the parts do not match 100%. We highly recommend having a certified mechanic do the installation. &###xA0;These minor dents or scratches will not effect the fitment, functionality or performance of your exhaust parts. Customer Service: With over 25 Years of being in business, we are able to assist you with the greatest of ease. 817 30th Street Union City, NJ 07087. The item "Dual exhaust conversion kit Fits 99 08 Chevrolet and Gmc pick up trucks 2.5" is in sale since Wednesday, October 12, 2016. This item is in the category "eBay Motors\Parts & Accessories\Car & Truck Parts\Exhaust\Exhaust Systems". The seller is "coltexhaust" and is located in Union City. This item can be shipped to United States.